Microsites are an excellent tool for highlighting single products, launching special promotions or augmenting an advertising campaign in a non-traditional and unconventional way that a full website cannot. A microsite is not the same as a normal website. They serve only one purpose and as such they don’t have to play by the same rules. Typically comprised of a small collection of pages, if not single scrolling, microsites are simply designed to engage the user while creatively presenting some sort of information. Rather than offering multiple navigation options, microsites direct users to one specific goal or purpose. Ultimately you need to evaluate your marketing needs to determine whether a microsite will provide any actual value for your brand. If you want to promote something specific in an unusual and engaging way, then a microsite might just be the perfect online solution for you. These sites live separately to your company website and so you can use a different tactic or style to reach a different audience. They can be a great tool for generating new business leads and growing interest in your brand. As we’re simplifying the traditional website by removing many of the standard options, it allows you to be really specific and to focus in on a particular topic or product. As users who are on your microsite are likely to be interested already, it is essential that your content is of a high standard and is actually engaging for your audience. Remaining focused ultimately means less confusion and a more effective message. Keep your end goal in mind at all times when planning your microsite. What are you hoping to achieve? Maybe you’re raising awareness about a certain topic with a simple call to action e.g driving donations or launching something to simply generate brand interactions. Once you have established the goal create your content around that. Be concise and intentional. Any users on your microsite should immediately realise its purpose, and retain the information you have provided on it. It’s the information on a microsite that tends to drive the engagement. Microsites allow you to move away from your main website’s design. It’s a chance to show off your creative ability and a different side to your brand. One which might create a closer connection with a different target audience. In addition to an unconventional design, an easy user experience will lead to more enjoyment and better engagement. There are endless possibilities when it comes to designing a cool microsite,,, That’s what’s so good about them. They live separately from the restraints of existing brand assets and remain flexible and focused. Check out this cool interactive microsite below. It’s for the latest series of ‘House of Cards’. 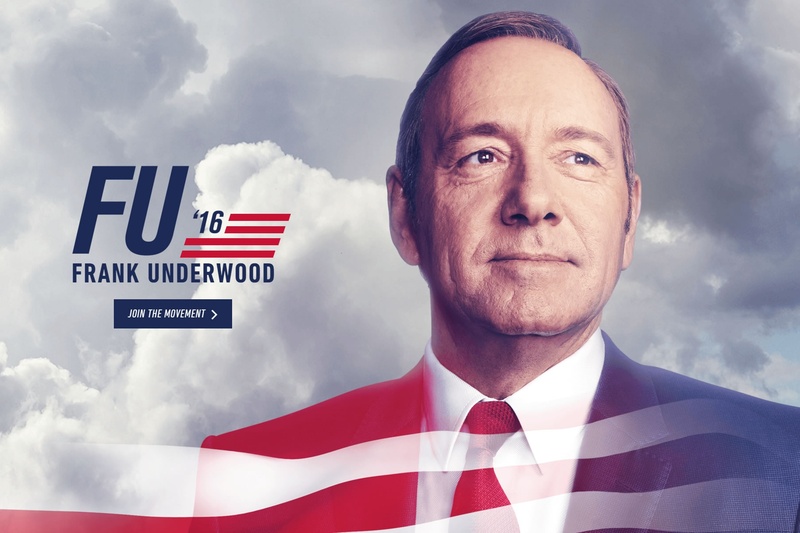 It invites users to join the Frank Underwood movement. The design is great and realistically it functions better than the websites of real life presidential candidates. Everything from Underwood’s shifty eyes to the quality video content, every aspect draws the user in and offers plenty to keep them there.